Want to get off-grid power in your shed? We show you how with this handy guide covering all the basics from figuring out your power needs, to understanding 12V systems, to choosing batteries, power sources and more – everything you need to run your shed on green, mains-free energy. Do you just need a couple of lights for occasional use, or do you plan to run broadband, a computer, heating, or a host of power tools? The amount of power you require dictates the type of system you install, so calculating your power requirements is key to setting up a system that works for you. Photonic Universe provide a useful chart that matches the power consumption of electrical items you intend to use in your shed, to the power rating required from your inverter, which we’ll discuss in the next section. For example, a 5W mobile phone charger will require an inverter with a continuous power rating of at least 150W, whereas a 400W desktop computer would require at least 600W. To work out the power rating of your inverter, simply add up the required wattage of all the equipment you’ll be using. If you need to plug in a computer and mobile phone, the inverter would need a continuous power rating of 150W + 600W = 750W. Once you have captured the energy from the sun or wind, you need to store it for later use by feeding it into a ‘deep cycle battery’ or a ‘deep discharge battery’. The electrical current stored in the battery is usually 12V and is DC. You can install a bank of more than one battery to increase the available power store. Household items, like computers, washing machines, phones etc., require a 240V AC power supply. To convert the 12V DC current from your battery bank, you need to route the electricity from the battery through an inverter, which converts the power to AC. Installing cables of the correct rating is essential. Overload your circuit and it will overheat and could catch fire; go for too high a rating and you’re just wasting money. To help you get it right, Solar-Wind provide a handy tool to help you work out which cable rating is right for your needs. If in doubt, contact them directly for advice. Positioned between the power source and the battery, a charge controller stops your battery over-charging by regulating the amount of power channeled to it. Fitted to a wind turbine system, a run / stop switch enables you to temporarily slow down and/or stop the turbine from operating should you wish to, for example, to reposition it. To simplify the process of powering your shed, there are kits available with all the parts you need included. Midsummer supply a range of kits for solar power, and Wind and sun have some good offerings for wind power. There are plenty of options to choose from out there – the key is to make sure that the kit you buy matches your power needs now and in the future. explains John Coupe from ‘Secrets of Shed Building’. Simple. 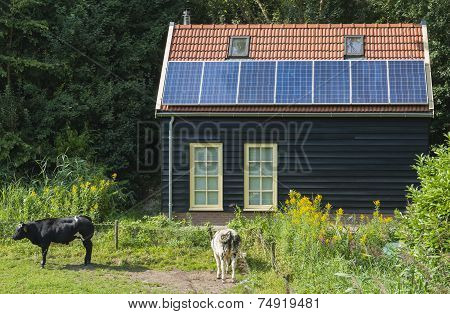 These panels can be sited either on the ground nearby, or on the shed roof itself. Panels fitted to a roof can be neat and unobtrusive, unlike the more obvious presence of a wind turbine. According to Eco-shed of the Year winner, Kevin Holland, fitting a solar panel to a battery is no more difficult than wiring a plug. A UK based solar system could suffer from a lack of available sunshine, particularly in the winter months. If your shed is located in a very shady position, then the lack of sunshine even on bright days could limit the amount of electricity generated. The power in the wind is proportional to the cube of its speed; twice the wind speed gives eight times the power. Small differences in average windspeed cause large differences in available wind energy. So, for optimum performance, it is important to find a site which offers the highest overall wind speeds. 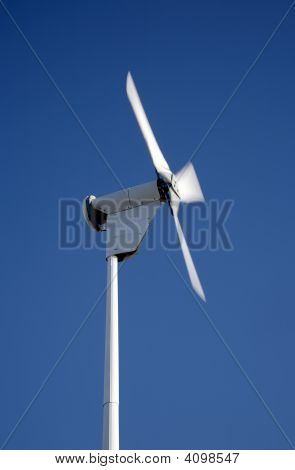 Wind turbines can be roof mounted or pole mounted. According to Which, while “micro roof-mounted wind turbines are cheaper, they’re also less efficient and will produce a lot less electricity than pole-mounted ones”. On the other hand, the cable that runs between the power source and the battery is expensive and may limit how far away from your shed you can install a pole mounted turbine. Can be a good source of power during the windy, sun-restricted, winter months. If your turbine is positioned in the right location, a large amount of electricity can be generated quickly. Correct positioning is very important but is not always easy to achieve, particularly when the cost of the cable limits where you can site your turbine. In the same way that solar-generated electricity is reduced in wintertime, during the summer, lighter winds can limit the amount of power available from wind turbines. If you can afford it, a combination of both wind and solar power gives you the best of both worlds. Taking your shed off-grid is simple to achieve, good for the environment, and could save money in the long-term. What are you waiting for?